You are invited to join us for inspiring services! Enjoy a traditional Shabbat morning service, sprinkled with beautiful Chassidic melodies, insights into the prayers and a brief discussion on the weekly Torah portion. Just a few seats left for Dinner Under the Stars on Sunday night. Please reserve (suggested contribution: $25 adult, $12 child) as soon as possible! Journey of the Soul explores the mysteries surrounding our spiritual existence that continues even after we’ve shed our earth-bound body suit. We examine the transition of the soul into the hereafter, and the accompanying emotional journey that helps the soul and those closest to it prepare for its new reality. Journey of the Soul will also help you focus on the parts of life that really matter; assist you in becoming more in touch with yourself and with your spiritual dimension; and help you uncover a newfound relationship with loved ones who are no longer physically here. 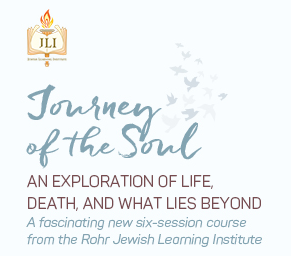 Journey of the Soul will be held on 6 Tuesdays, starting on October 27th, at our new center. To order, please use our Event Reservation form and select 'Lulav & Etrog Order'. Please place your order ASAP to assure availability. 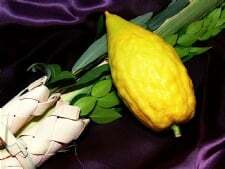 NOTE: Your Lulav and Etrog will be available for pickup from the rabbi's house on Sunday, Sep 27th (Sukkot begins that evening). Services will be held at our new center, located at 2047 W. Main St, Suite B7, League City, TX 77573. DIRECTIONS: From the I-45 and FM 518 (Exit 23), head west on FM 518 (Main St), after the first light, turn left into Cornerstone Shopping Center. The center is "U" shaped, we are located at the bottom of the "U" (right next to the gown shop). Highlights not to be missed include the sounding of the Shofar on Monday and Tuesday at around noon. Please see Upcoming Events column (scroll down on right), or website, for schedule details. 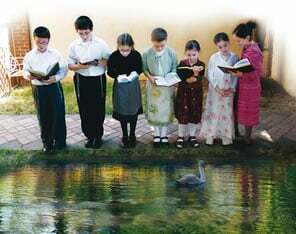 Join us on the first day of Rosh Hashana, Monday, September 14, for the beautiful custom of "Tashlich." Meet up at Rabbi Yitzi and Malky's home (1910 Claiborne Dr) at 5:30 pm, for the short walk to Clear Creek and the brief Tashlich ceremony at the water. New Center - Be a part of it! We are excited to be kicking off the new year of 5776 with a brand new center to better serve the community! We invite you to take part in helping to make it all possible. Please see our website to see a list of sponsorship opportunities or to make a contribution of any kind. Every dollar counts and is most appreciated! Cost: Basic Set: $40 | Better Quality Set: $54. To order, please use our Event Reservation form and select 'Lulav & Etrog Order'. 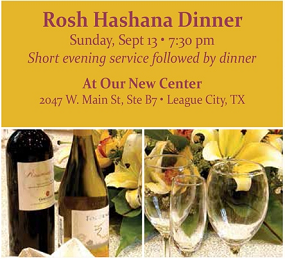 RSVP: Festive Rosh Hashana Community Dinner! Hurry, only days left to make your reservations for the festive Rosh Hashana Eve Community Dinner! Join us at our beautiful, new location for the complete range of High Holiday Services and events. As always, there is no charge for services, though making advance reservations with a suggested contribution is most appreciated. Reservations for the community dinner is required.